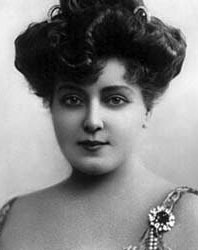 Actress and opera star Lillian Russell was among the rich and famous who flocked to Saratoga in the late 20th century. Russell's distinct personality still makes her stand out in the history of society women. Born in 1860, Russell was raised in Chicago. When she was 18 her parents divorced, and the young woman moved to New York with her mother and quickly became a professional performer. Comic opera was her speciality, and she travelled all over the world performing in operettas and theatre. She was well known for her amazing stage presence and beautiful singing voice. She was an advocate of women's suffrage, and was a great philanthropist to a cause close to her own heart, the Chorus Equity Association, which helped struggling girls in the chorus line of shows. Russell visited Saratoga quite often with companion Diamond Jim Brady, and was first seen in Saratoga in 1882. She often caused quite a scene, bicycling down Broadway on her gold-plated bicycle with handlebars that bore a monogram encrusted in jewels. Lillian's Restaurant - a downtown Saratoga mainstay for more than four decades until its closing in 2015 - was named in her honor.